Most pet owners usually have questions about how much food to feed their dog. While that question seems straight forward, the answer is unfortunately not that simple. Much depends on the unique circumstances of your dog. This article will help you understand how to determine the correct amount of food your dog needs every day. The first thing to understand is, that dogs are similar to people when it comes to body weight, in that, maintaining the proper weight is crucial in ensuring good health. However, that is where the similarities end. Your canine companion is a dog and not a person and dogs have different needs than people. Overweight dogs usually suffer from arthritic problems, increased incidences of metabolic diseases like diabetes and liver problems, as well as a lack of energy and skin problems. They often also have a shortened life expectancy and are more prone to get and die from cancer. Underweight dogs, less common than overweight dogs, often suffer from a lack of energy, poor muscle tone, metabolic and reproductive disorders and delayed healing. The benefits from providing proper nutrition in the correct amount are immeasurable to the health and longevity of your canine companion. If you take a look at the feeding recommendations on bags and cans of commercial dog foods with fairly similar levels of fats, proteins, fiber, etc., you will find wide discrepancies (up to 50%) on how much each manufacturer claims is the right amount of food to feed. You can understand why dog food manufacturers want you to feed more - you need to buy more dog food from them if you run out faster. However, I think most people would agree that feeding your dog should be to his/her benefit and not the benefit of the balance sheets of the dog food manufacturers. Also, given these wide discrepancies, it seems pet food label recommendations are not the best source of information. They are usually based on the weight of a dog and that by itself is not a good way to determine a canine's food needs. 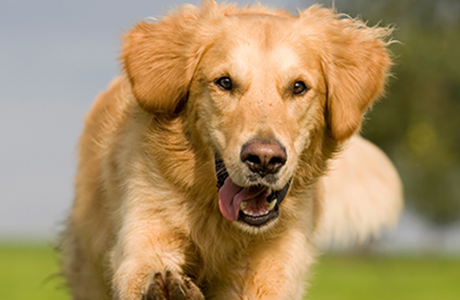 The nutrition a dog needs depends on his energy requirements and not just his body weight. People are all fairly similar in their energy needs, so all we have to do is look up our weight on a chart, make a few adjustments for age and activity level and get a good read on what our daily calorie intake should be. For dogs however there are huge differences; canine calorie requirements depend on a multitude of factors like breed, size, growth rates in puppies, activity levels, skin and coat thicknesses, and living conditions. Just think of two 90 lb German Shepherds; one lives outdoors and accompanies a hunter on extended hunting trips daily, while the other lives in a heated apartment and is walked for 1 hour a day. Do you think both of these dogs should eat the same amount of food? Of course they shouldn't, but according to the pet food labels they should. So how do we do this correctly to make sure we feed our dog the correct amount of food? It's not hard and I will walk you through. Now that we know how many calories our furry friend would need if he/she wouldn't move a muscle all day, we need to calculate what he/she really needs as your dog is probably not sleeping 24/7. The following table will help with this adjustment. My German Shepherd is a 6 year old, neutered male and he gets 1 hour of rollerblading a day (for exercise) plus 1 hour of walking (for discipline). I am classifying this as "Neutered, adult normal activity" and so I need to adjust the RER by 1.6; hence my dog needs: 1295 kcal/day * 1.6 = 2072 kcal/day. While we have a pretty good idea for the daily calorie requirements from step 1 and 2 there are additional considerations that can change those numbers. Especially characteristics like breed differences, air temperature, and coat insulation, can additionally alter an individual dog's energy requirement as much or more than any of the activities listed above. Because of this, it is unfortunately impossible to provide a one size fits all recommendation for every dog. Every dog's nutritional needs are different. However, the RER we calculated is a good starting point so your dog is not going hungry. In determining what your dog ultimately gets in terms of daily calories you also need to factor in any treat or table food you might give. Start with feeding your dog the calculated amount of calories and monitor your dog's weight (weigh him monthly) to see if he is losing or gaining weight or remains stable. If your dog is at a good, healthy, stable weight you really don't want weight fluctuations and the amount of food is ok; should he gain weight, feed some less; should he lose weight, feed some more. This doesn't have to be complicated. I.e. if your dog always leaves food on his plate give him less and see how he responds. If you are concerned about making any mistakes in feeding your dog or have specific weight loss/gain goals or have a dog with health problems you should always consult with your veterinarian to develop a nutritional plan based on your dog's condition. If in doubt, seek help from a professional to ensure your dog is ok. Most dogs should be fed once a day at the same time every day. Feeding at the same time will keep your dog on a bathroom schedule. However, some dogs, especially the larger breeds, need to be fed more than once a day. Ask your vet how many times a day you should feed your dog. Feed your dog the same type and brand of food every day. Unlike humans, a dog digestive system cannot handle changes in food. It can cause upset stomach and diarrhea. When switching to a new food gradually transition him to a new food by mixing portions of both foods until you slowly phase the old food out. Your dog may experience diarrhea if his food is suddenly changed. If you are mixing water to dry food you should mix 4 parts dry food to 1 part water. Keep fresh drinking water available at all times. Change the water at least once day, more for dogs who drool. Monitor your dog's weight and activity level, and make feeding adjustments as necessary. Some dogs can do well on self-feeders. If your dog is overweight, or if he is going to the bathroom inside the house, you may want to get him on a feeding schedule. This article provides information solely about the amount of food to feed your dog and not what kind of food to feed. Obviously high quality, organic, natural foods are preferable over cheap by-product laced junk. In a future article we will take a closer look at what commercially available dog food contain and which ones have better ingredients than others; reading labels can be enlightening with dog products, as that market is far less regulated than that for people food. Small Animal Clinical Nutrition 4th Edition by Hand, Thatcher, Remillard and Roudebush; Walsworth Publishing Company. Marceline, MO; 2000. Small Animal Clinical Nutrition 3rd Edition by L. Lewis, M. Morris and M. Hand; Mark Morris Associates. Topeka, KS; 1987.